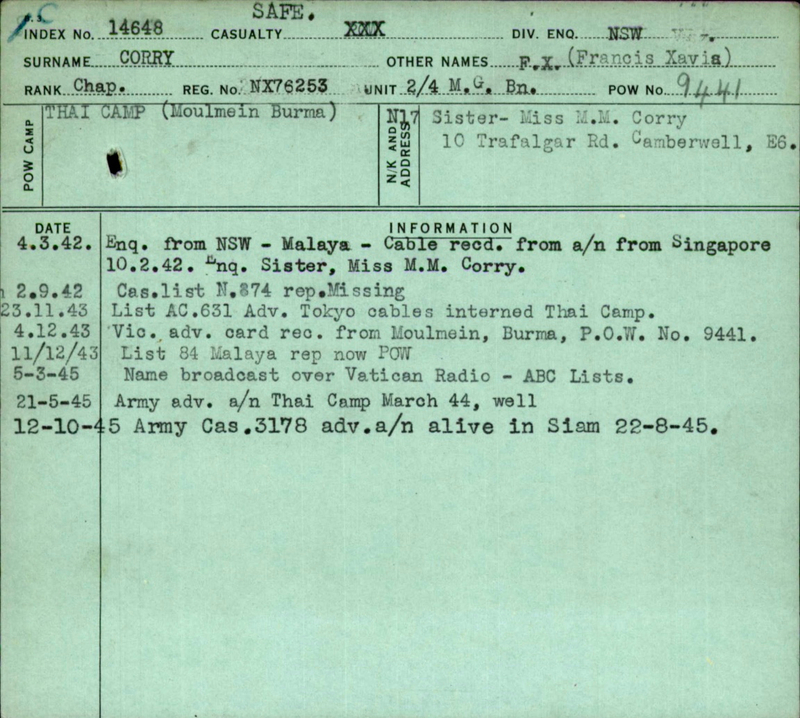 Victoria Point, Reptu 30km Camp to Thanbyuzayat 28.10.1943. Remained at Thanbyuzayat until moved to Aungganaung 105km Camp. Joined Williams No. 1 Mobile Force to 133km Camp Thailand. Father Corry, a Roman Catholic priest, returned to Our Lady of the Rosary Church at Prospect, South Australia. Father Corry’s date of death is recorded as 2 September 1965 aged 65 years at Prospect. His parents John Thomas Corry and Ellen Mary Hoare married in 1890 Hawthorn, Victoria. Father Corry was the youngest of seven children. There were four older sisters and two older brothers, although William born in 1901 died aged 3 years in 1903. John Thomas Corry died in l910 when his youngest son Francis was 12 months old. Sadly Francis would never have known his father. His mother died in 1941, the year Father Francis enlisted. Father Corry presided over the funeral service for 2/4th’s WX8986 David Holm who had been wounded in action at Pasir Panjang on 14 February 1942 including gunshot wounds to his skull. He died of a cerebral abscess on 2 March 1942. WX9197 John Edgar Peers was admitted to 2/10th AGH and died of his wounds on 6 March 1942. Father Corry conducted his service. WX7904 Raymond Matthew ‘Blue’ Smith suffered a infected cyst in his eye. Following an operation on 1 February he was discharged on 13 February 1942. He was later admitted to AGH on 9 April 1942 but tragically died 10 days later on the 19 April 1942. Rohan D. Rivett, War Correspondent and POW on Burma-Thailand Railway and author of “Behind Bamboo” published in 1946 Page 212 wrote “Padre Corry who despite much sickness himself, served unwearyingly”. 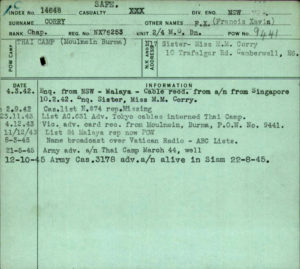 He was at Victoria Point, Burma and next at Reptu 30km until 28 October 1943 then moved to Thanbyuzayat when it was being operated as a hospital (without medical facilities and medicines) where he assisted with sick. He then went to Augganaung 105km Camp. Here in December 1943 when the railway was completed he joined some of Williams Mobile Force No. 1 into Thailand with Lieutenants Kevin Boyle, Graham Wilson, Ken Lee and Pte John Malthouse, and from Java Party No. 5A Robertson Force, Ted Cosson and Merve Wilkinson . It is believed they travelled to Neikhe 133km Camp before being moved south to Kanchanaburi and Tamarkan arriving 11 or 12 January 1944. Father Corry presided over the funeral for NX10420 Robert Goulden’s funeral on 12 July 1942 at Victoria Point, Burma following his execution by the Japanese who insisted Goulden was trying to escape. It seems Father Corry was at Tamarkan hospital Camp. He presided over the funeral service for 2/4th David John Davies WX8855 who had died of cerebral malaria on 10 July 1944. Corry was assisted by Lt-Col Green and Lt-Col Blakeway. Father Corry would preside over the deaths of many POWs throughout his incarceration. These are known to us because they were 2/4th men. We also know Father Corry himself suffered tropical illnesses and was at times very ill himself. Unfortunately little more is known of Father Corry’s movements or how he returned to Australia. He was recovered at the end of the war from Thailand 20 August 1945.